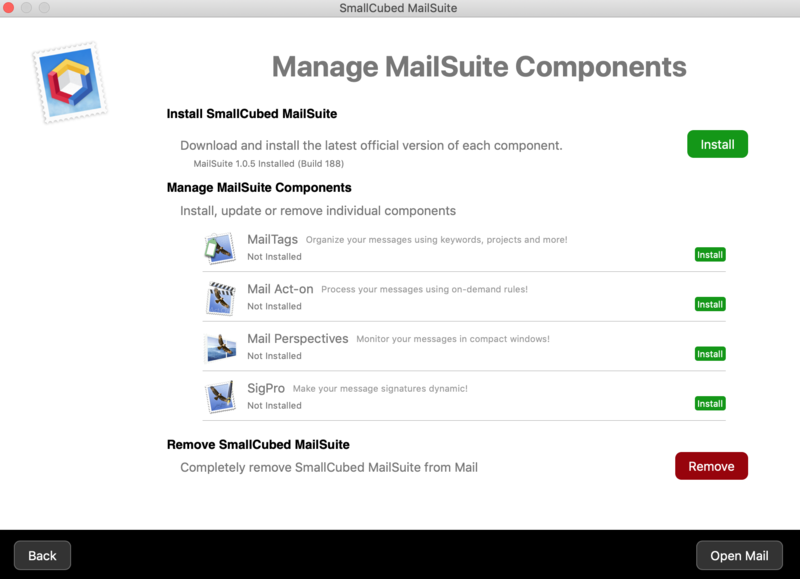 In Sierra, High Sierra and Mojave, once SigPro is installed you can access its preferences through the Signatures tab in Mail’s prefernces. 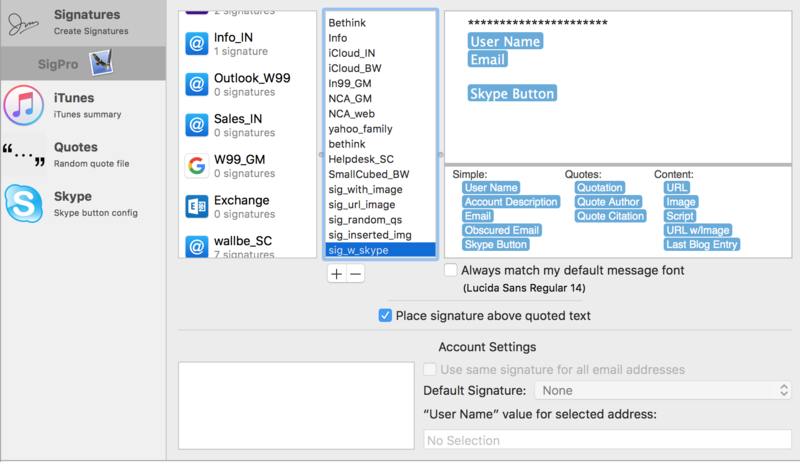 SigPro’s initial signatures pane is conveniently located in the Mail Signatures pane. It provides a set of tokens that can be incorporated into any signature. When the signature is used, the token will be replaced with the relevant content to provide a customized signature for each email. 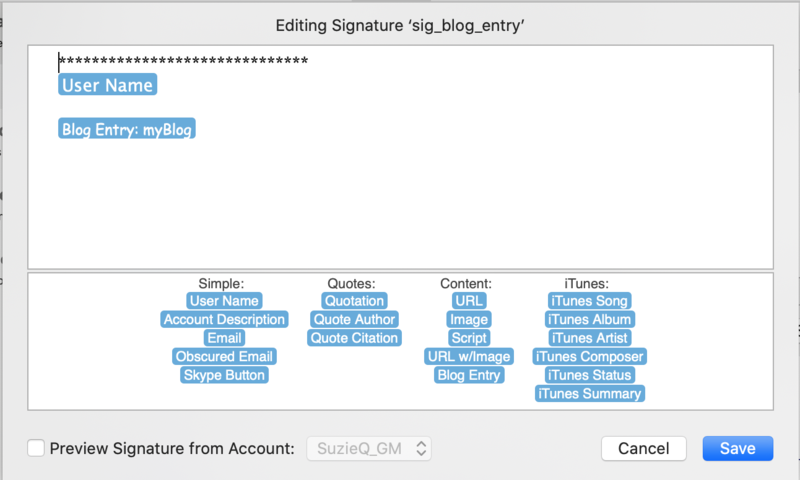 Tokens can be added to the signature by dragging them into the signature window. 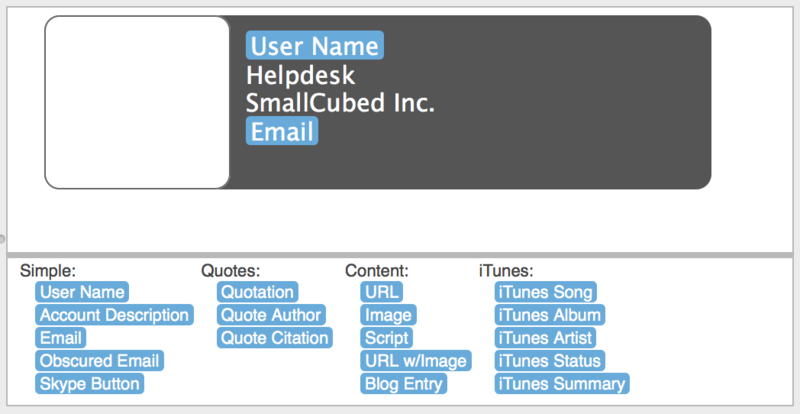 User Name: The “Full Name” field in the Accounts definition or defined in the SigPro pane for individual email addresses. 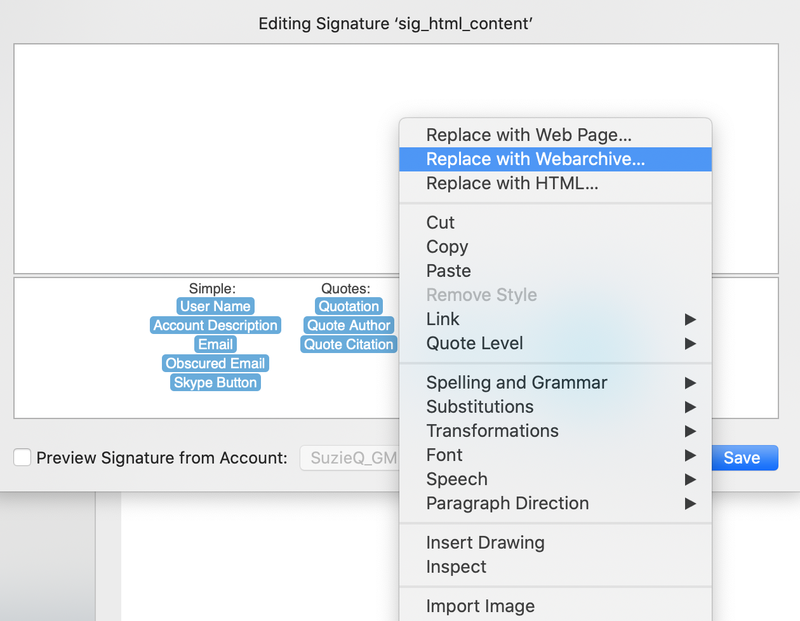 Using SigPro it is easy to add content to your signature using a web archive file or an html file through the contextual menu. 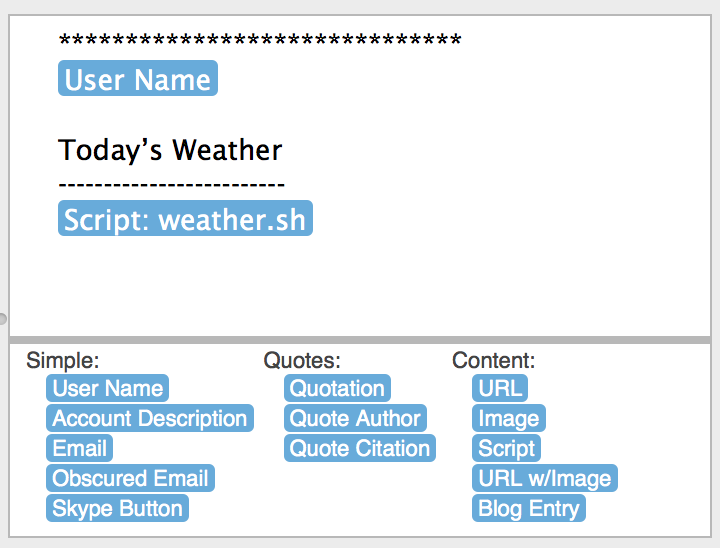 After adding html content or a web archive file, you can add tokens to complete the signature. 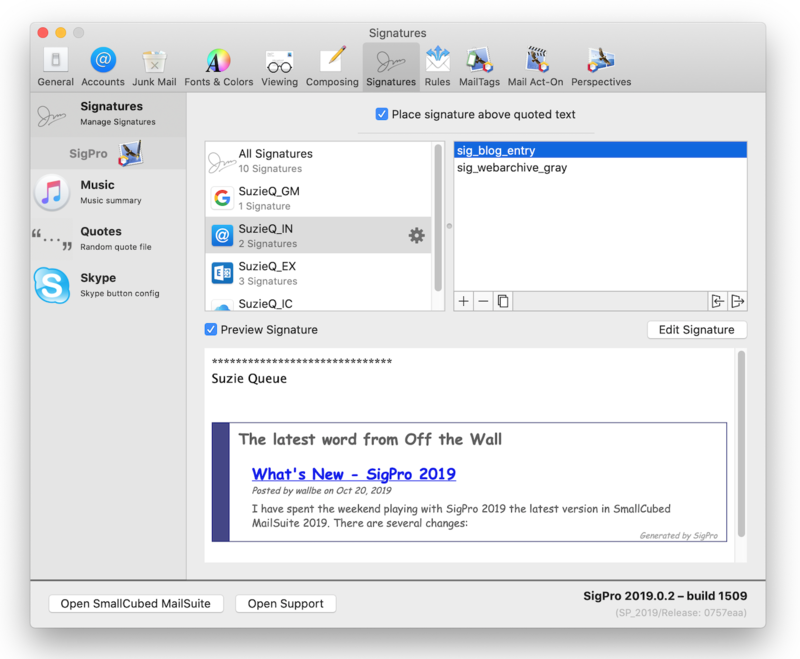 Note that with web archive files, images won’t be visible in the signature editor, but will show up correctly in the signature. 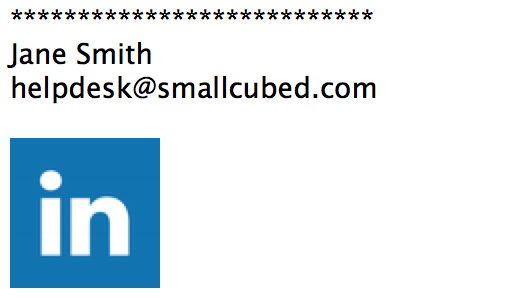 Add formatting to the tokens through the formatting menu of Mail. Any formatting applied to the token will be applied to the replacement text. 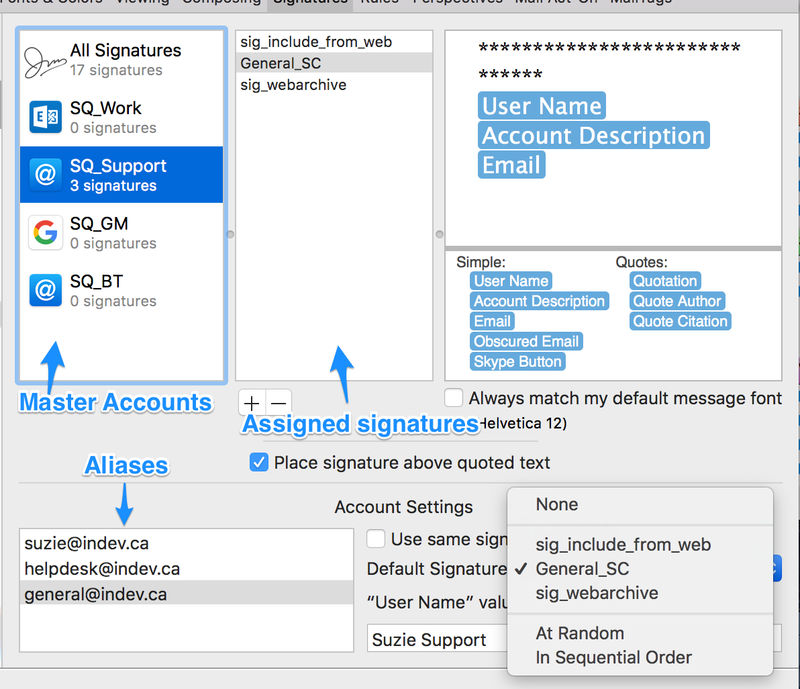 Aliases appear in the small box in the Account Setting section under the Signature information when the master account for the alias is selected. 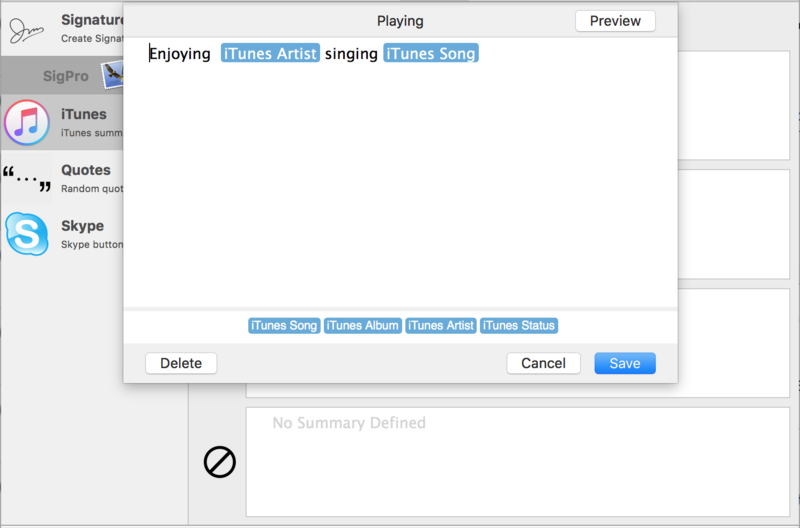 The iTunes tokens iTunes Song:, iTunes Album:, iTunes Artist: and iTunes Status: can be dragged into any signatures. However, they will only have information if iTunes is playing. 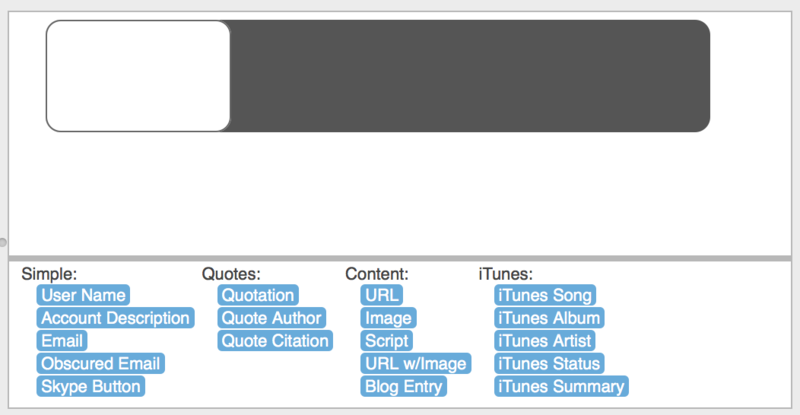 Another way to display iTunes infromation is to use the iTunes Summary: in your signature. 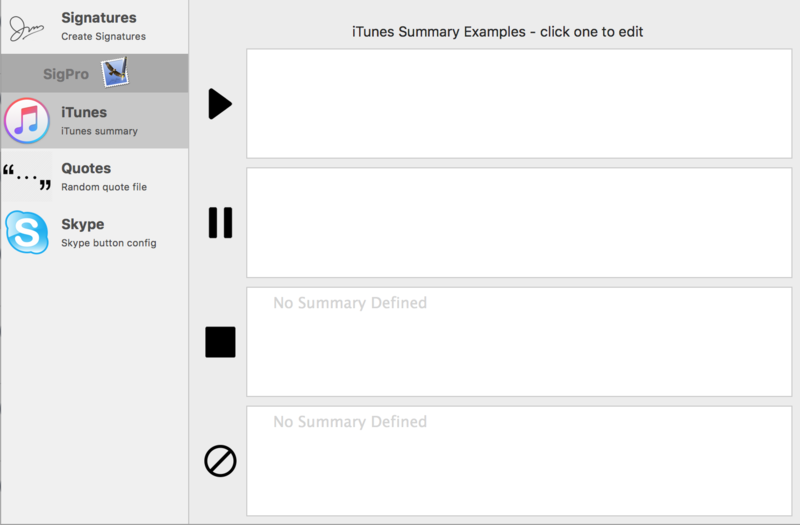 The iTunes Summary: will display the content of the status signatures as setup in the iTunes signature window. You can have a different signature display depending on whether iTunes is: playing, paused, open but not playing, or not open. 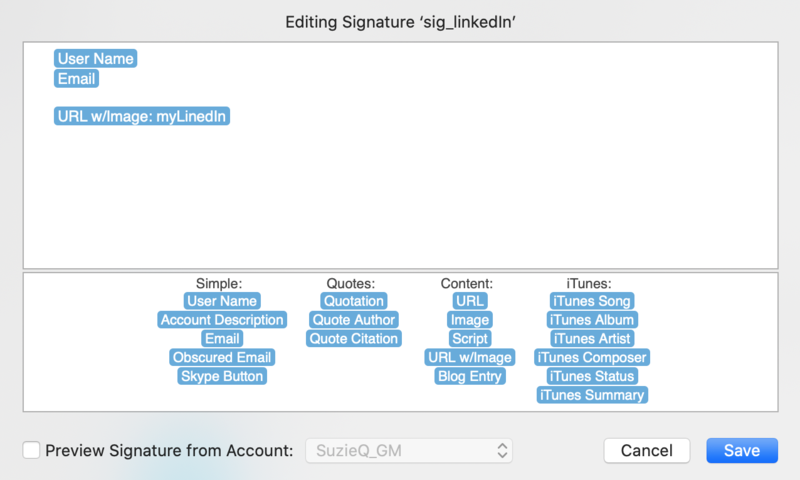 The quotes tokens can be used to insert the “Quotation”, “Quote Author”, and the “Quote Citation” into a signature. Each token can be formatted separately as desired. 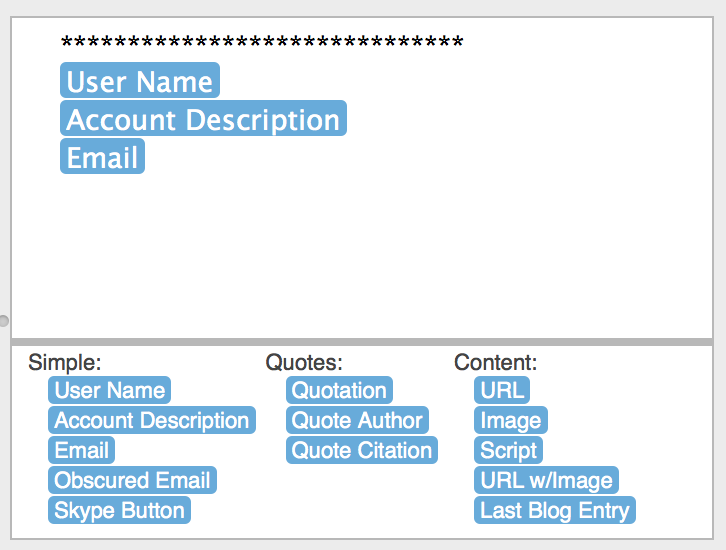 The tokens will be filled in from the content of your “Random Quotes File”. 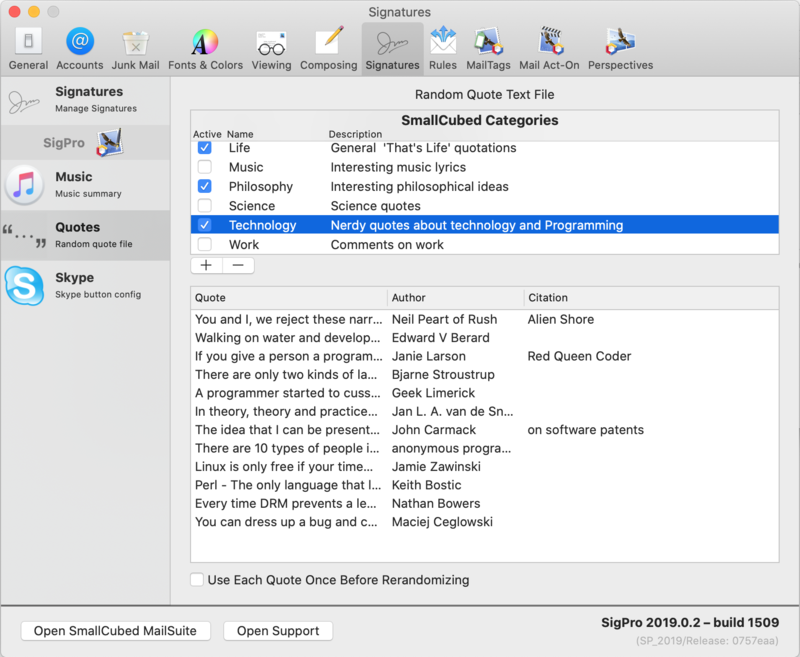 In the Signature sidebar there is the “Quotes” section for selecting a “Random Quotes” file to import for use with your signatures. The “Ramdom Quote” file should be a standard text file(.txt) with each quotations, separated by a carriage return. Each line should be broken into three parts: a quotation, an author and a citation. 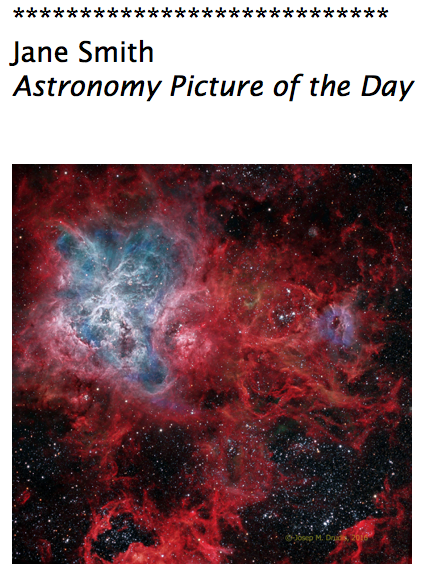 You can also have a quotation that is multi-line. In order to do this simply wrap the entire entry in brackets (). The brackets must be the first and last non-blank characters around the quotation, author and citation. The line breaks will be respected in the signature. 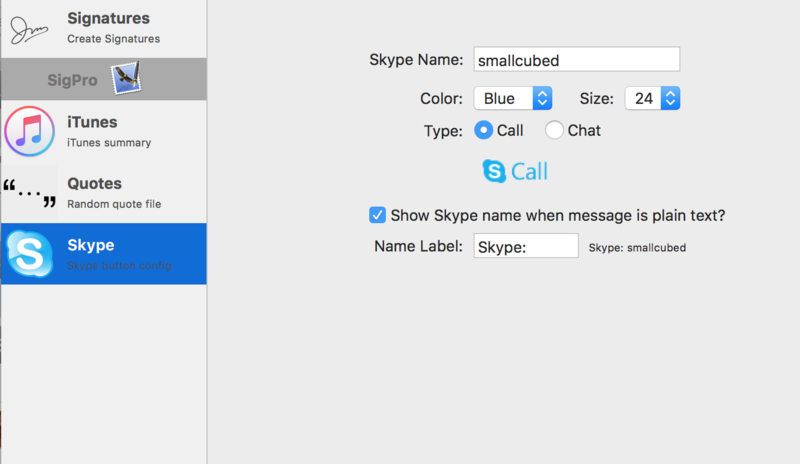 To add a Skype link to a signature, set up your Skype name in the Skype tab, then drag the Skype token into the signature. 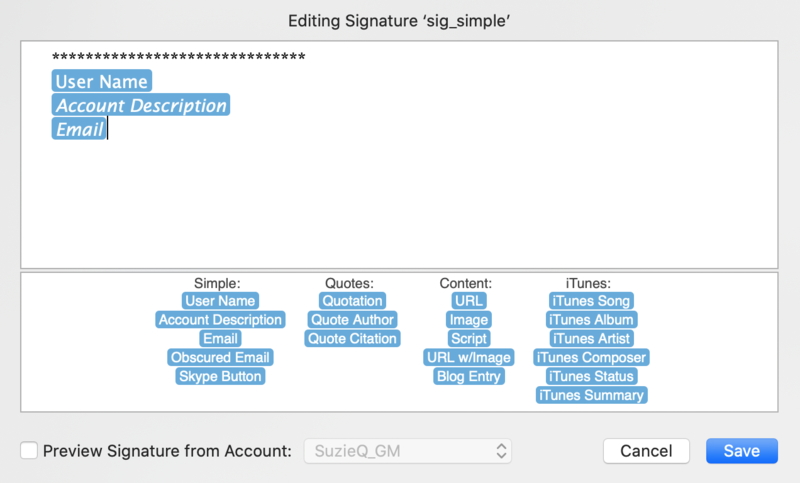 The script token allows scripts to be used to pull content into a signature. 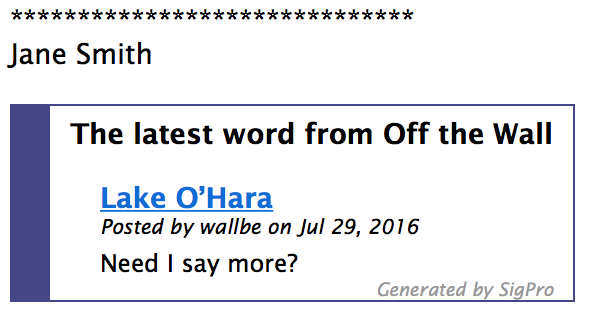 This is an advanced feature for users who are comfortable with script writing. 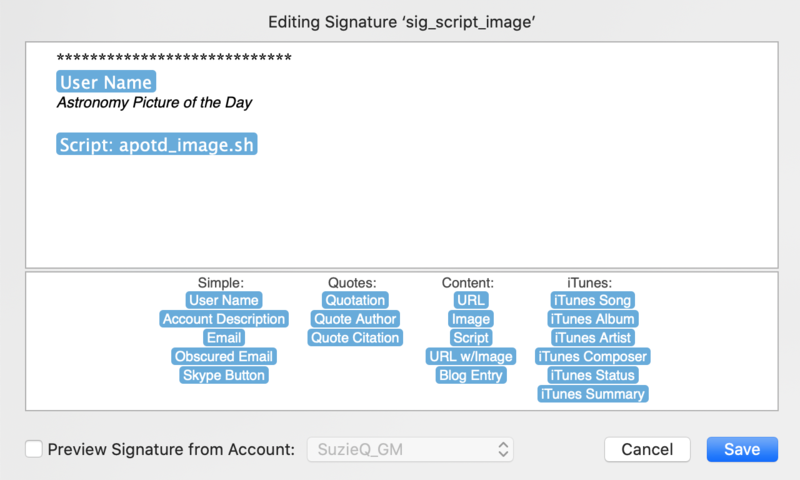 When the script token is dragged into a signature it provides a Finder window to select the scripts. A second window then appears to provide arguments and set whether to use <pre> tags. 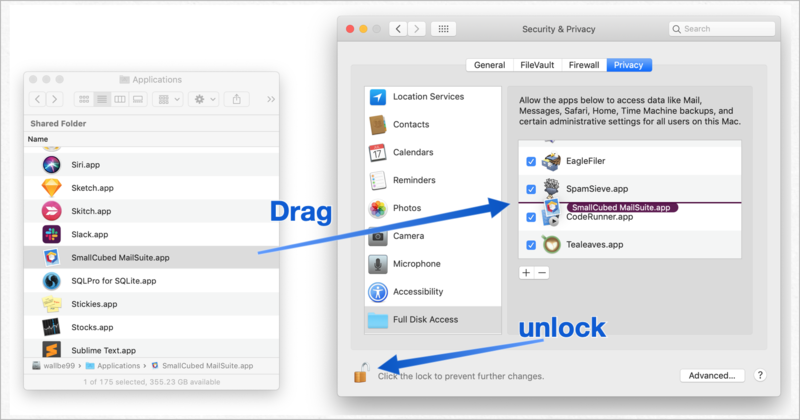 The permissions on script files need to be set to be executable. This is true for all script types except for Applescript. Arguments are passed as a simple list separated by spaces. Currently no parsing is done to handle values with spaces in them. The <pre> tags are used to insert line brakes in the script output. 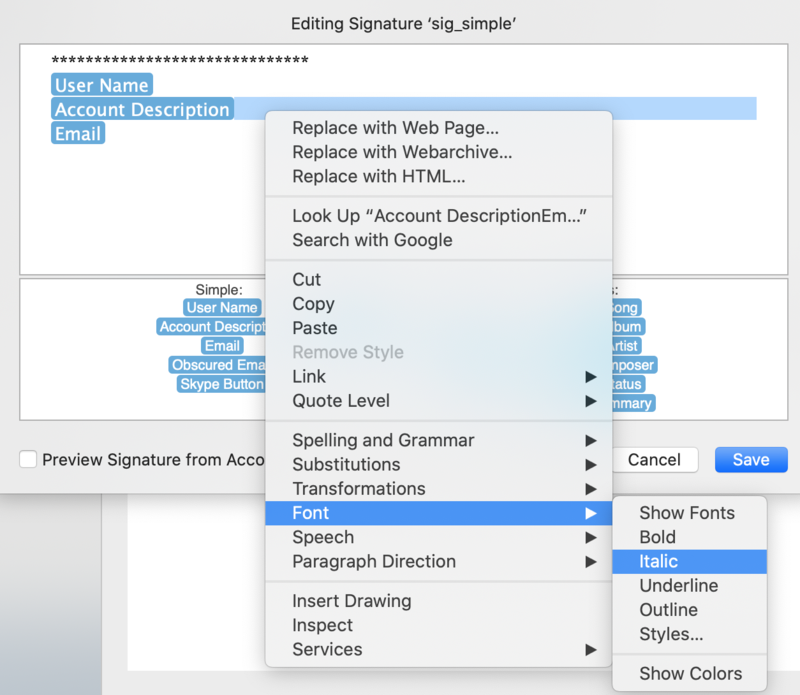 When they are present a <br/> tag is placed at the end of existing signature content and replaces any line break in the script’s returned data. 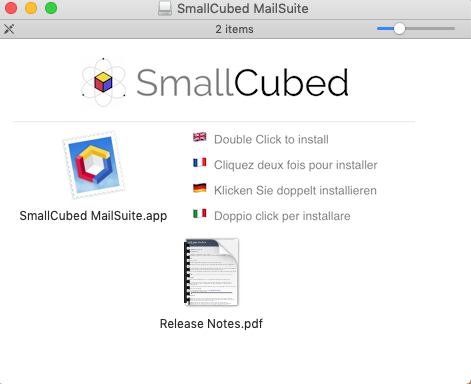 If you have further questions, or SigPro doesn't act as you expect, you can contact us at the following email address: support@smallcubed.com.